“Rituals for Work” is an accessible guide to the rituals that individuals, teams, and organizations can use to make their work lives more meaningful. Drawing from empirical research and rich examples from industry, the authors show how rituals can spark creativity, get to flow, deal with conflict and failures, and build a culture of innovation. “Rituals for Work” is available now. Rituals are powerful tools that reinforce good habits, motivate personal and professional achievement, create common bonds between co-workers and build shared values. They can transform an organization’s culture and provide a foundation to achieve common goals. 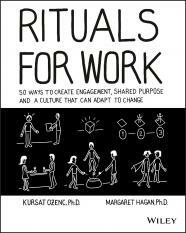 In the new book published today,Rituals for Work, Strategic Design Consultant Kursat Ozenc, Ph.D. and Director of Legal Design Lab at Stanford University Law School, Margaret Hagan, Ph.D., outline the power and benefits of workplace rituals and provide a foundation to achieve common goals. Filled with illustrations, the visual guide focuses on real-world examples and case studies to highlight the positive impact rituals have on organizations. Ozenc and Hagan explore 50 creative rituals, in business, management, design and personal development, to outline ways to build a culture of engagement, innovation, and shared purpose for organizations of all sizes, across all industries. Kursat Ozenc, Ph.D. is a Senior User Experience Designer at SAP Labs Palo Alto. He teaches interaction and service design at Stanford Institute of Design (the d.school). He also leads workshops on rituals for personal and group relationships, organizational change, and civic design. Margaret Hagan, Ph.D., JD, is director of the Legal Design Lab at Stanford University. She teaches classes at the d.school and is a thought leader in the legal industry, pioneering how to bring a human-centered approach to how legal and government groups serve people. About the Book - Rituals for Work: 50 Ways to Create Engagement, Shared Purpose, and a Culture of Bottom-Up Innovation (Wiley, April 2019, ISBN: 9781119530787, $34.00, 272 pages). For more information visit the book’s page on wiley.com.